David Chazan, “True Mastermind of Paris Terror Attacks ‘Still at Large,’” Telegraph (London), July 13, 2016, http://www.telegraph.co.uk/news/2016/07/13/true-paris-attacks-mastermind-still-at-large/. The attacks—targeting public venues including France’s soccer stadium, Bataclan music hall, as well as restaurants, bars, and cafes—claimed the lives of 130 and wounded more than 350.Cara Anna, “Names, details of more victims emerge from Paris attacks,” Washington Post, November 16, 2015, https://www.washingtonpost.com/national/names-details-of-more-victims-emerge-from-paris-attacks/2015/11/16/82ab7bda-8c3f-11e5-934c-a369c80822c2_story.html. Abaaoud was killed on November 18, 2015, during a major police raid in the Paris suburb of St. Denis. At least one other person, a woman who detonated a suicide vest, was reported killed in the seven-hour-long raid.Aurelien Breeden and Kimiko de Freytas-Tamura, “Chief Suspect in Paris Attacks Died in Raid, France Says,” New York Times, November 19, 2015, http://www.nytimes.com/2015/11/20/world/europe/paris-attacks.html. Aurelien Breeden and Kimiko de Freytas-Tamura, “Chief Suspect in Paris Attacks Died in Raid, France Says,” New York Times, November 19, 2015, http://www.nytimes.com/2015/11/20/world/europe/paris-attacks.html. Abaaoud was first identified by police as a wanted terrorist in January 2015, following a gun battle between Belgian police and suspected ISIS jihadists in Verviers, eastern Belgium.Josh Halliday and Jonathan Bucks, “Suspected Paris attacks mastermind Abdelhamid Abaaoud: what we know,” Guardian (London), November 16, 2015, http://www.theguardian.com/world/2015/nov/16/abdelhamid-abaaoud-suspected-mastermind-of-paris-terror-attacks. The extremist cell in Verviers—reportedly led by Abaaoud—stands accused of plotting an assassination attempt on Belgian police officers. Abaaoud has been tried in absentia by a Belgian court and sentenced to 20 years in prison for his role in recruiting for ISIS. He has also been accused of kidnapping his younger brother Younes, who traveled to Syria in January 2014.Josh Halliday and Jonathan Bucks, “Suspected Paris attacks mastermind Abdelhamid Abaaoud: what we know,” Guardian (London), November 16, 2015, http://www.theguardian.com/world/2015/nov/16/abdelhamid-abaaoud-suspected-mastermind-of-paris-terror-attacks. 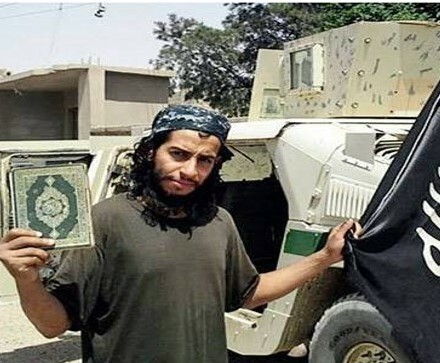 While with ISIS in Syria, Abaaoud was one of the most active executioners for the terrorist group, according to French radio station RTL.Jean Alphonse-Richard, “Attentats à Paris: Abdelhamid Abaaoud, commanditaire présumé des attaques,” RTL, November 16, 2015, http://www.rtl.fr/actu/societe-faits-divers/attentats-a-paris-abdelhamid-abaoud-commanditaire-presume-des-attaques-7780524858. He also appeared in a 2014 video driving a pick-up truck carrying mutilated bodies to a mass grave.Josh Halliday and Jonathan Bucks, “Suspected Paris attacks mastermind Abdelhamid Abaaoud: what we know,” Guardian (London), November 16, 2015, http://www.theguardian.com/world/2015/nov/16/abdelhamid-abaaoud-suspected-mastermind-of-paris-terror-attacks. Before his death, he was believed to serve as the link between senior ISIS leadership and its operatives in Europe,Paul Cruickshank, “Who is Abdelhamid Abaaoud, suspected ringleader of the Paris terror attack?” CNN, November 18, 2015, http://www.cnn.com/2015/11/16/europe/paris-terror-attack-mastermind-abdelhamid-abaaoud/. and was also the suspected leader of ISIS's Katibat al-Battar al Libi branch.Andrew Higgins and Kimiko de Freytas-Tamura, “An ISIS Militant From Belgium Whose Own Family Wanted Him Dead,” New York Times, November 17, 2015, http://www.nytimes.com/2015/11/18/world/europe/paris-attacks-abdelhamid-abaaoud-an-isis-militant-from-belgium-whose-own-family-wanted-him-dead.html. In addition to the deadly November 13 attacks, Abaaoud was linked to the thwarted August 2015 train attack carried out by suspect Ayoub El Khazzani, as well as a foiled attack on a Parisian church in April 2015.Josh Halliday and Jonathan Bucks, “Suspected Paris attacks mastermind Abdelhamid Abaaoud: what we know,” Guardian (London), November 16, 2015, http://www.theguardian.com/world/2015/nov/16/abdelhamid-abaaoud-suspected-mastermind-of-paris-terror-attacks. In an interview with ISIS’s Dabiq magazine following the January 2015 raid in Belgium, Abaaoud claimed to have evaded Belgian authorities and escaped back to Syria. He also claimed that he was stopped, but ultimately released, by an officer who recognized him.“Interview with Abu Umar al-Baljiki,” Dabiq, February 2015, https://azelin.files.wordpress.com/2015/02/the-islamic-state-e2809cdc481biq-magazine-722.pdf. Abaaoud was raised in the highly volatile Molenbeek suburb of Brussels, infamous for producing a large number of the country’s foreign fighters, jihadists, and assailants. Abaaoud himself was believed to have been radicalized in Belgium’s Saint Gilles prison, while serving time there on theft charges.Andrew Higgins, “Belgium Confronts the Jihadist Danger Within,” New York Times, January 24, 2015, http://www.nytimes.com/2015/01/25/world/europe/belgium-confronts-the-jihadist-danger-within.html?smid=tw-nytimes&smtyp=cur. He was the subject of Western airstrikes in Raqqa, Syria, as recently as October 2015.Paul Cruickshank, “Who is Abdelhamid Abaaoud, suspected ringleader of the Paris terror attack?” CNN, November 18, 2015, http://www.cnn.com/2015/11/16/europe/paris-terror-attack-mastermind-abdelhamid-abaaoud/. Abdel-Hamid Abu OudIan Black and Josh Halliday, “Abdel-Hamid Abu Oud: alleged mastermind of Paris attacks,” Guardian (London), November 16, 2015, http://www.theguardian.com/world/2015/nov/16/abdel-hamid-abu-oud-alleged-mastermind-paris-attacks. Abou Omar el-BelgikiAndrew Higgins, “Belgium Confronts the Jihadist Danger Within,” New York Times, January 24, 2015, http://www.nytimes.com/2015/01/25/world/europe/belgium-confronts-the-jihadist-danger-within.html?smid=tw-nytimes&smtyp=cur. Abou Omar SoussiAndrew Higgins, “Belgium Confronts the Jihadist Danger Within,” New York Times, January 24, 2015, http://www.nytimes.com/2015/01/25/world/europe/belgium-confronts-the-jihadist-danger-within.html?smid=tw-nytimes&smtyp=cur. Abu Umar al-BaljikiJosh Halliday and Jonathan Bucks, “Suspected Paris attacks mastermind Abdelhamid Abaaoud: what we know,” Guardian (London), November 16, 2015, http://www.theguardian.com/world/2015/nov/16/abdelhamid-abaaoud-suspected-mastermind-of-paris-terror-attacks. “All my life I have seen the blood of Muslims flow. I pray that God breaks the backs of those who oppose him... [and] exterminates them.” (Video) Andrew Higgins and Kimiko de Freytas-Tamura, “An ISIS Militant From Belgium Whose Own Family Wanted Him Dead,” New York Times, November 17, 2015, http://www.nytimes.com/2015/11/18/world/europe/paris-attacks-abdelhamid-abaaoud-an-isis-militant-from-belgium-whose-own-family-wanted-him-dead.html. “For the sincere believers, I will pray that Allah will guide them, help them, ease them, and support them, to go forth to jihad in the path of Allah. For those who are tyrants, their soldiers, and their worshippers, may Allah break your backs and exterminate you. Allah willing, He will exterminate you in the world and the Hereafter. This is your brother in Allah, Abu Omar al-Belgiki.” (Video)“Belgian Jihadist Fighting with ISIS in Syria: It's Nice to See Infidel Blood from Time to Time,” March 2014, http://www.memritv.org/clip/en/4210.htm. “Hasten to jihad, hasten to jihad! Hasten before it is too late. The enemies of Allah and of Islam have gathered worldwide, starting with the so-called 'peaceful' Buddhists, who exterminate, decapitate, rip apart, and eat the Muslims in Asia, or the Africans in Central Africa, who kill the Muslims, or the Westerners, or the Shiites, may Allah curse them. They are all gathered against the Sunni Muslims, who want the victory of Allah. For an hour a sniper has been trying to get me, but by the will of Allah, he won't succeed. And if he does get me, if will be the will of Allah, the destiny of Allah, and I will be satisfied.” (Video)“Belgian Jihadist Fighting with ISIS in Syria: It's Nice to See Infidel Blood from Time to Time,” March 2014, http://www.memritv.org/clip/en/4210.htm. “Some of us had to leave behind our wives, our mothers, our fathers, and our property. We left our lives in this world for the sake of Allah, to elevate the word of Allah.” (Video)“Belgian Jihadist Fighting with ISIS in Syria: It's Nice to See Infidel Blood from Time to Time,” March 2014, http://www.memritv.org/clip/en/4210.htm. “Is there anything better than jihad and martyrdom in the path of Allah? What can be sweeter than martyrdom in the path of Allah?” (Video)“Belgian Jihadist Fighting with ISIS in Syria: It's Nice to See Infidel Blood from Time to Time,” March 2014, http://www.memritv.org/clip/en/4210.htm. “I would like to send a message to those who stay put and do not wage jihad: Arise and go forth to fight in the path of Allah. Go forth to victory in this world and in the Hereafter.” (Video)“Belgian Jihadist Fighting with ISIS in Syria: It's Nice to See Infidel Blood from Time to Time,” March 2014, http://www.memritv.org/clip/en/4210.htm. “Admittedly, there is no joy in spilling blood, although it's nice to see from time to time, the blood of the infidels, because we were educated, growing up, seeing all over the world, on TV, the blood of the Muslims, which for decades has been shed.” (Video)“Belgian Jihadist Fighting with ISIS in Syria: It's Nice to See Infidel Blood from Time to Time,” March 2014, http://www.memritv.org/clip/en/4210.htm. “Here I am in a trench, as you can see, protecting myself from the bullets, the shelling of the enemy – the apostates who are fighting us because we want to instate Islamic law. They advance towards us with tanks, heavy artillery, and many men. We are about 50 men in front of them. Most of us are carrying simple Kalashnikovs, a few RPGs, and a few PKC [machine guns]...” (Video)“Belgian Jihadist Fighting with ISIS in Syria: It's Nice to See Infidel Blood from Time to Time,” March 2014, http://www.memritv.org/clip/en/4210.htm. “You will find this only in your religion, only in jihad. Is there anything better than jihad or a martyr?” (Video)Andrew Higgins, “Belgium Confronts the Jihadist Danger Within,” New York Times, January 24, 2015, http://www.nytimes.com/2015/01/25/world/europe/belgium-confronts-the-jihadist-danger-within.html?smid=tw-nytimes&smtyp=cur. “While living in Europe, I never ate food like I have eaten here. I have entered into villas and palaces that, praise be to God, have, through the will of God, been provided for us here.” (Video)Andrew Higgins, “Belgium Confronts the Jihadist Danger Within,” New York Times, January 24, 2015, http://www.nytimes.com/2015/01/25/world/europe/belgium-confronts-the-jihadist-danger-within.html?smid=tw-nytimes&smtyp=cur. “All my life, I have seen the blood of Muslims flow... I pray that Allah will break the backs of those who oppose him, his soldiers and his admirers, and that he will exterminate them.” (Video)Josh Halliday and Jonathan Bucks, “Suspected Paris attacks mastermind Abdelhamid Abaaoud: what we know,” Guardian (London), November 16, 2015, http://www.theguardian.com/world/2015/nov/16/abdelhamid-abaaoud-suspected-mastermind-of-paris-terror-attacks. “They arrested Muslims in Greece, Spain, France, and Belgium in order to apprehend me… All those arrested were not even connected to our plans! May Allah release all Muslims from the prisons of these crusaders.”“Interview with Abu Umar al-Baljiki,” Dabiq, February 2015, https://azelin.files.wordpress.com/2015/02/the-islamic-state-e2809cdc481biq-magazine-722.pdf. “I ask Allah to accept the fruitful deeds of the shuhadā’ who terrorized the crusaders of America, France, Canada, Australia, Germany, and Belgium.”“Interview with Abu Umar al-Baljiki,” Dabiq, February 2015, https://azelin.files.wordpress.com/2015/02/the-islamic-state-e2809cdc481biq-magazine-722.pdf. “Belgium is a member of the crusader coalition.”“Interview with Abu Umar al-Baljiki,” Dabiq, February 2015, https://azelin.files.wordpress.com/2015/02/the-islamic-state-e2809cdc481biq-magazine-722.pdf. “Alhamdulillāh, Allah chose me [and others] to travel to Europe in order to terrorize the crusaders waging war against the Muslims.”“Interview with Abu Umar al-Baljiki,” Dabiq, February 2015, https://azelin.files.wordpress.com/2015/02/the-islamic-state-e2809cdc481biq-magazine-722.pdf.